The new park is owned by the Rajgreen Group of Companies, one of the fastest-growing business conglomerates in India. The park's development was estimated at US$26,327,500 (€25,000,000). Amaazia will eventually cover 16 acres (6.5 hectares). The far-reaching facility is being developed by Sanderson Group, an international thematic entertainment design and construction corporation. Sanderson was first set up in Australia and now has its headquarters in Malaysia. Early visitors to the new waterpark described it as the "best experience of my life," "world-class" and outright "awesome." Special comments singled out the award winning King Cobra waterslide. The other waterslides are all uniquely desgined for the park. 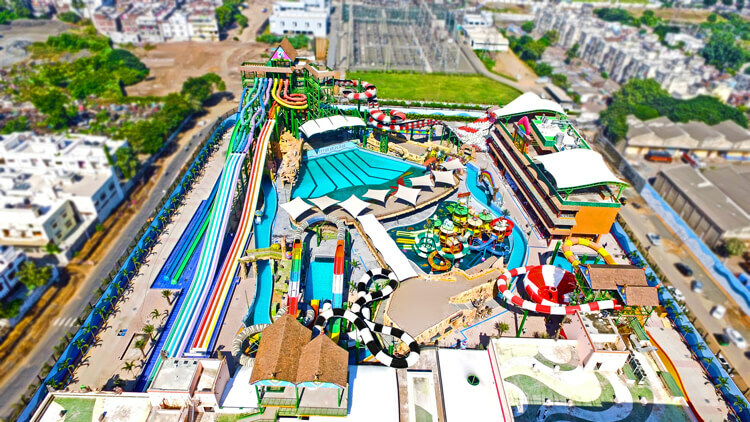 Most of them are fusion, combination waterslides that offer thrilling ride experience. At the same time, all the waterslides are RTM manufactuıred and they feature natural lights and special patterns.